This is a great article written by none other than P.V.H. Weems himself. Three navigators and a radar operator are kept fully occupied in navigating a B-29 to the Pole and back. 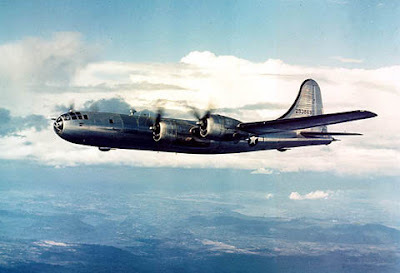 Through the courtesy of the Alaskan Air Force Commander the writer flew as an observer from Fairbanks to the North Pole and return (Ptarmigan Flight of July 21, 1948), and from Anchorage to San Francisco (Stork Baker Flight of July 27, 1948). These routine AF weather flights permitted a study and a comparison of navigation equipment, methods, and techniques. Previous flights have been made in over-seas naval and commercial aircraft. The Ptarmigan Flight permits a comparison between normal navigational methods and the special methods required for high latitudes. Shortly after take-off at Ladd Field Air Force Base, Fairbanks, Alaska, we flew through an overcast, steering by the flux gate compass. After breaking out above the overcast, our astro-compass observations showed an error of some 20° in the flux gate compass, quickly illustrating one of the special difficulties of polar navigation. Normally the flux gate compass performs better than this, but above 70° latitude principal dependence is put on the astro- compass for setting and checking the course. 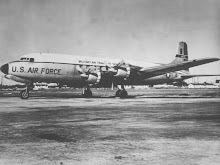 The B-29 plane, Lazy Daisy May, took off at 0550, weighing approximately 130,000 pounds, and returned 15 hours, 35 minutes later, weighing 90,000 pounds, having used 40,000 pounds, or 20 tons, of fuel. To give a clearer mental picture of the quantity of gasoline used, it would be the weight of ten 4,000 pound automobiles, or 130 fifty-gallon drums of gasoline. Only a rich nation, and one on such an important mission, could afford the expense. The data collected permits longer range and more accurate weather prognostications and at the same time provides valuable crew training. * The opinions or assertions in this article are the private ones of the author, and are not to be construed as official or reflecting the view of the Navy Department, the A ir Force, or the services at large. Survival Equipment included rubber boats, hunting and fishing gear, foul weather clothing in abundance, food, water, radio, etc. In case of emergency, it is believed that the crew could survive indefinitely, if they succeeded in reaching land, ice, or water alive. A Graduate of the Naval Academy in 1912, Captain Weems was retired in 1933, but returned to active duty in World War II as Convoy Commodore. He is best known, however, as an air navigation specialist, being the author of the Line of Position Book, Star Altitude Curves, Marine \avi- gation, etc. He is the inventor of Mark II Aircraft Plotter and the Second Setting Watch. He has written more than 25 articles for the ProceedIngs. The magnetic compass, with poor performance due to weak magnetic directive force and rapidly changing variation, is supplemented by the astro-compass. Direction is determined by astro-compass observations taken at 20 minute intervals above 70° latitude. This method of setting course is accurate, and, if made automatic, would be highly satisfactory. As it is done at present, these astro-compass readings and resultant paper work require most of the time of one navigator. The astro-compass is similar in principle to the equatorially mounted astronomical telescope. The latitude of the observer, and the declination and hour angle of the observed body (in this case, the sun), are set on the astro-compass and its sighting vane is pointed toward the sun. With these conditions met, and the instrument leveled, the azimuth scale indicates the plane's true heading. It is used in the same manner as an azimuth circle is used on a ship's compass. Drift was determined by three independent methods: (1) Gyroscopic drift indicator, (2) Radar, and (3) Bellamy pressure pattern drift. On one occasion the observed drift taken almost simultaneously was +4° by gyro drift indicator, +3° by radar, and +3|° by the Bellamy method. This is a most impressive performance, considering the relatively inaccurate drift observations of a few years ago. hour, and at other times as needed when nearing the pole. These observations indicated wind shifts and the plane's track. A Bendix Sextant (the "coffee grinder") gave good results. Time was read from a watch set to the exact second of Greenwich Civil Time. The Air Almanac and H. O. 230 (restricted) were used to reduce the observations to positions. The actual computations were made on scratch paper and thrown away. The observer began a series of observations at 25 minutes after each hour by starting the sextant averaging timer which ran for exactly 2 minutes, and making coincidence during this interval. The resultant average altitude was recorded as having been made at 26 minutes past the hour. Similarly, observations were made from 29 to 31, for 30 minutes, and from 33 to 35, for 34 minutes. Only the middle set of observations, that for 30 minutes, was worked out, but the observations for 26 minutes could be plotted from an assumed longitude 1° to the east, and the 34 minute observation from 1° west, and thereby use the same computed altitude and azimuth for all three sets of observations, since the hour angle would be the same in each case. An old hand soon gets on to wrinkles in each case, which will save time and drudgery. Duties of first navigator, Captain Breeze, consisted of hours of detailed work: recording an immense amount of data, applying repeated drift corrections, plotting celestial lines of position, observing radar scope, giving data for position reports, etc. Except for a few moment's relief, Captain Breeze sat almost continuously at his desk for 15 hours and 35 minutes, fully concentrated on navigation work an estimated 95 per cent of the time. The second navigator was busy with the astro-compass, and the third navigator with the sextant and drift indicator, and computing lines of position. Comparison of Pilot and Navigation duties indicates that we have made much greater progress in piloting than in navigating aircraft, especially in polar regions. The crew jokingly said they could identify pilots by "barnacles on their bottoms and corns between their forefingers and thumbs!" The pilot and co-pilot had little to do while on gyropilot other than to "twiddle" the knurled control buttons. This condition is not to the credit of the guild of navigators, since we urgently need more nearly automatic navigation equipment. An analysis of Ptarmigan flights indicates that each person added to the crew represents a pay-load loss of 2,550 pounds. We therefore discussed the possibility of reducing the number in the crew, (a) by cross- training the co-pilot and engineer, (b) by cross-training the 2nd navigator and radar operator, (c) by using the new automatic tracking system with the sun or a star to give the true heading continuously, and (d) by automatically and continuously feeding the altitude of the observed body to the navigator's station. With the altitude and azimuth of the sun or of a star continually available, one navigator should be able to navigate the plane without undue strain. Under present conditions in polar regions, three navigators plus a radar operator are not only needed, but all four are kept extremely busy. This excess personnel should not, however, be considered a complete loss, due to the extremely valuable and much- needed special training the Ptarmigan flights afford. While the equipment and methods for the Ptarmigan and the Stork Baker Flights were essentially the same, the techniques differed widely. The principal difference was the availability of the magnetic compass and Loran. W'ith the problem of direction satisfactorily solved by the flux gate compass, the astro-compass was used only a few times and merely as a check. This saved full time for one navigator. was made of double drift observations with the gyroscopic drift indicator. Frequent double drift observations were made on white caps, the plane altering course 45° to right and 45° to left of course during observation, with an estimated time loss of only one minute for each observation. Loran was used effectively, when available, and was especially valuable during the last portion of the flight, and just prior to making a radar land fall. At times only single loran lines could be observed due to erratic scope images from the second pair of stations. The large loran chart, scale 1:2,000,000, was used for all navigation, although this required frequent folding of the chart. The first navigator, Captain Halsell, suggests the use of a smaller scale, approximately 1:4,000,000, for off-shore navigation. The smaller scale chart could then be spread flat for convenient use, and would cover the entire flight. Celestial Navigation was used relatively little on the Stork Baker Flight due to overcast, in contrast to its extended use on the Ptarmigan Flight. Also by an unusual situation, celestial navigation was made more difficult. Navigators are required to carry a complete set of H. O. No. 218 tables, but apparently someone had miscounted the list before take-off, with the result that the available tables extended only to 44° north latitude, whereas the D R position at time of sight was near 49°. Actually, the tables were used by assuming Lat. 44° and using a long altitude intercept to lay down lines of position. Unfortunately, while flying at 1,000 feet the sky was almost continuously overcast. On the 500 mile leg at 10,000 feet, both the sun and the moon were visible most of the time. For some as yet unexplained reason, after we were within the range of the tables, the celestial fixes were apparently not as accurate as usual, with the result that by the time celestial navigation should have been effective, loran lines were proving more satisfactory and were used to a greater extent. (a) Prefers a sextant which permits direct observation of stars. On this flight there was never darkness, but only twilight, before sunrise, making it difficult to locate stars, especially Polaris. He mentioned the Link Sextant for this purpose, and this should be available. He used the Fairchild A-10-A sextant. (b) Suggests rearrangement and simplification of the Flight Record form. In discussion it was agreed that where forms are too intricate they are seldom filled out completely, since to do so would require too much time. (c) For demonstration, took bearing of plane's shadow to get reciprocal relative bearing of the Sun. A special wind drift computer used by the weather observer, for the rapid solution of drift by the Bellamy method. The same problems may be solved with the E-6B computer when a latitude scale is added. 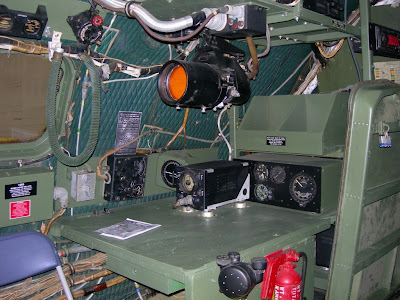 Incidentally, the E-6B Dalton navigation computer is used by weather observers and radar operators and by B-29 engineers as well as by the navigators. 9975, X = 199 = Ground Speed. We had been using G/S 198. The absolute altitude as furnished by the weather observer was used, as well as a special timer reading to tenths of a second. work 10 to 20 seconds longer to get a more accurate solution under all conditions with short tables which replace several volumes of tables. The effectiveness of radar was illustrated when the first definite land-fall appeared on the radar scope. The navigator soon reduced his strenuous exertions (and perspiration!) with sextant, loran, and drift indicator. As the plane approached the Golden Gate Bridge, the usual but impressive radar bombing run was made on the left bridge tower. With the radar operator in control, "bombs away" was given at a point to insure a hit. The crew teamwork showed to good advantage throughout the flight. It is obvious that we are working on correct principles and that our efforts should be directed toward still further improving the methods of putting these principles into effect. There appears to be a need for a standard navigation work book for the orderly solution and permanent record of the various problems to be solved by the navigator. Where lives and property depend on the calculations and observations of the navigator, it would appear desirable to keep these solutions in an orderly way both for the benefit of the navigator and as a check on his work. All too frequently important work is written on scratch paper and thrown away at the end of the flight. It is obvious that navigation equipment should be more conveniently arranged and made more nearly automatic, in order to relieve the navigator from unnecessary drudgery and to increase the_over-all efficiency of aircraft. (1) Provide automatic recording features to as many of the navigation instruments as possible, including the astro-compass. (2) Place loran, radar, and sextant observation positions near the navigator to save time and drudgery. (3) Supply at least one sextant, such as the Link, which permits direct observation of faint stars. (5) Use Star Altitude Curves as a pre- least, there is an advantage in having as the computed method. plane commander an expert in navigation. airlines will show that while the equipment train each as specialists. latest equipment to reduce the number of overlaps that of navigation.